Do you hate wasting money on disposable straws? I know that I hate buying them and seeing them all end up in the trash within a day or two. The kids think they need a new straw for every drink they get, even if its the same thing they just drank. What a waste of money in my opinion. They do have the hard plastic straws available which are good for kids but I find a bit hard to clean well. I have heard of glass straws and to be truthful have been a bit scared of them. 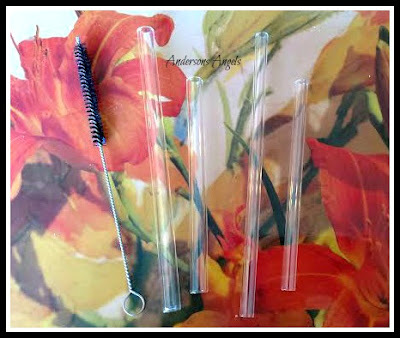 But recently Strawesome sent me a starter set of glass straws for the Holiday Gift Guide to try. I received a starter set of glass straws (short straw, short smoothie straw, Regular Straw, Smoothie Straw), a cleaning brush and a special glass straw with a frog on it. I must say that I love the frog straw it has become my straw and I don't allow anyone else to use it. My biggest fear with glass straws was cleaning them. I was so afraid i'd break them but thanks to the cleaning brush that came with them I have had no problems. I simply wash them with hot soapy water and place them on my drying rack standing up. I love having these straws now because they are eco-friendly and we are not wasting money anymore on disposable straws. Mr. Anderson even took one of the straws with him to work for his water and other drinks. I am sorry that I did not get glass straws sooner for my house. 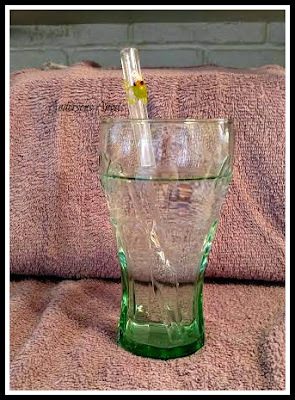 These straws make a great gift for anyone who is wanting to go green in their house. Make sure you check out the Strawesome website to see all their beautiful straws! I've started seeing these glass straws more often. I'm afraid to use them because of breakage fears.